My wife Martha and I have a small 501(c)(3) nonprofit called the Texas Center for Community Services; we go by TCCS. My wife is the director and I am a Department of Justice fully accredited representative. 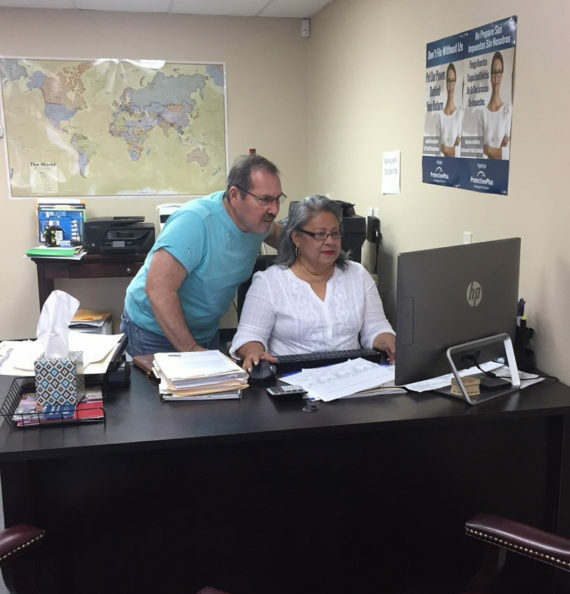 It’s a two-person outfit and we help the immigrant community of North Harris County and Montgomery County in Texas. Martha and I met when we both worked for the United States Citizenship and Immigration Services (USCIS). I was an immigration officer and she was a contract worker; a file clerk. 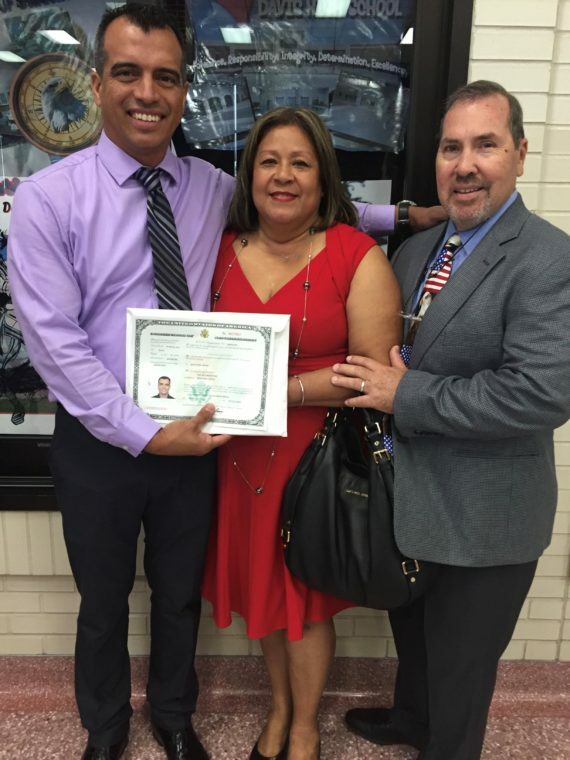 She is a Honduran immigrant who immediately, as soon as she was able to, became a U.S. citizen. I liked her attitude because she’s very grateful to this country and even before she retired she was trying to help people in the community. I grew up in South Texas, down in the Rio Grande Valley, 10 or 15 miles from the border. I really didn’t know any immigrants. I knew that all my friends spoke Spanish, but I didn’t know if anybody actually immigrated from Mexico because it was a different world back then in the fifties and sixties. I graduated from high school in 1971 and immigration was not as touchy a subject as it is now. We all considered ourselves Mexican Americans. My parents were born in Texas, my grandmother was born in Texas, and my grandfather was born in Texas. I think even my great grandparents were born in Texas; so we’re all Texans, or as they say “Texicans,” of Mexican descent. I am an Air Force veteran and I was first hired as a civil servant in the Department of Defense because of the Veterans’ Readjustment Assistance Act. When I managed to get my bachelor’s degree I was 49 years old! My schooling was as a paralegal and in 2002 or 2003 USCIS called me and I started working for them in Houston, Texas. I have a total of 31 or 32 years of federal service, but my last 15 years were with USCIS. At first I was a naturalization officer interviewing applicants for citizenship. I liked it because I love meeting people from different cultures. In Houston I started interviewing people from all over Asia, people from Europe, people from South America and Central America. In between questions, I enjoyed exchanging stories and learning about their different customs and traditions and food especially. But then when it came down to making the decisions it was often very difficult if I couldn’t approve someone’s citizenship because they were missing something or they weren’t eligible. I would have people crying because I couldn’t grant them what they wanted. But by law—the Immigration and Nationality Act—I couldn’t approve them and it broke my heart. I knew these people were hard workers. They had saved their money and they applied for citizenship. If it were up to me personally I would have approved every one of them, but I had to do a lot of denials. I didn’t like that part. I went from being a naturalization officer to doing community relations for USCIS. As a community relations officer I got to work with the different communities and that’s how I met a lot of the New Americans Campaign partners. I enjoyed that part of my career because I gave people information on how to become citizens, what it takes, and the benefits of being a citizen. Afterward I became a USCIS congressional liaison with the representatives’ offices in Houston if their constituents had immigration issues. The congressman or the office would contact us and we would research the problem and try to get the process back on track. Eventually I went back to adjudicating, as an officer handling adjustment of status, which is the process of getting a green card. Again, I often wished that I could just grant people an adjustment, but sometimes, by law, I had to deny them. That was frustrating. So when my wife and I retired we started this organization. We don’t just do immigration work, we do community work, but teaching people about citizenship is important to me. I am proudest of our citizenship class. We get people ready for the citizenship exam and I also give them a lot of information about everything, even if it is not really on the exam, like the electoral college, because I think it’s important for them to know that information. It’s a three-month course. For anyone who is ready, at about two-and-a-half months, I do mock citizenship interviews. I use what I learned as an immigration officer with the government to role-play. I give people a strategy. I tell them, “Concentrate on the history, civics, the writing and the reading for the first interview. And if your English is still not up to par and if you don’t pass the test the first time, then you have 60 days to improve on your English.” That strategy has helped us because people can pass the civics and history and then we start working with them to get their conversational English to the point to where they can pass the exam. After people pass their test we have them come back and describe their experience at the interview. They always praise my wife especially because she is very patient with people when they are learning English. She works with them to get them ready. One of the things that my wife and I do is we tell everybody every option, everything that can happen, the worst-case scenario, and that way they make an informed decision. It’s more challenging for me now than when I was an immigration officer because I feel I have to find a way. I think the government taught me a lot, but I learn more with every case. I know what the officers are thinking because I was one, and I am always preparing a counter action for whatever I think the government’s going to do. I want to be prepared with everything. These are people’s lives and they come depending on me to help them. The New Americans Campaign has been very helpful: we never turn anybody away, if they can’t afford it. Since we began in 2016, my wife and I have been to about 10 citizenship ceremonies personally. The first thing I told each of the people we helped is, “you’ve got to register to vote. It doesn’t matter who you’re voting for—just vote.” I listen to the news all the time and I see how anti-immigrant some of our political leaders are in Washington. I don’t understand that. I’m a retired immigration officer, but I’m pro-immigrant. Where would the United States be without immigrants? If I could speak to our political leaders directly, I would ask them that question.